Who Likes a Good Competition? Since the very first day we announced GGU Social, we have been passionately promoting our slogan “by students, for students”. Our most important mission is to help you deliver your thoughts and ideas to the GGU Community, and ultimately make our environment a better, more fun an entertaining place to live in. We have been asking for your suggestions and feedback since the first day GGU Social launched; but today, we are here to ask you a different question. We have been planning on hosting something fun on campus, something that was not done within the GGU premises before. Do you like games? Do you like a good, friendly competition? Answer the two question survey below to help us make our minds! The tournament will have a grand prize (not a t-shirt), and the entries will be free; however, limited. While this thought process is still a work-in-progress, we thought it’s finally time to share you what we have been hiding up our sleeves! With hoping that this got you a little excited about what’s to come… Let’s get back to our #SocialWednesday tradition and talk about this week’s featured club. “Our group was formed to provide a link between current GGU tax students and the professional tax community. There is an abundance of opportunity in the Bay Area tax community, from the large accounting firms (right across the street), to the boutique firms, start-ups, and corporations that thrive in and around San Francisco. Our aim is to be a resource for students looking for both career opportunities and career development. We are working to provide a variety of events, such as networking events and forums with local tax speakers. Taxation and Accounting students! Golden Gate University’s School of Accounting and Bruce F. Braden School of Taxation are hosting an open house event this Friday. In this event you will have the opportunity to learn more about the programs, tour the campus, meet faculty over lunch and tour local accounting firms! To learn more about the event and RSVP, follow this link. 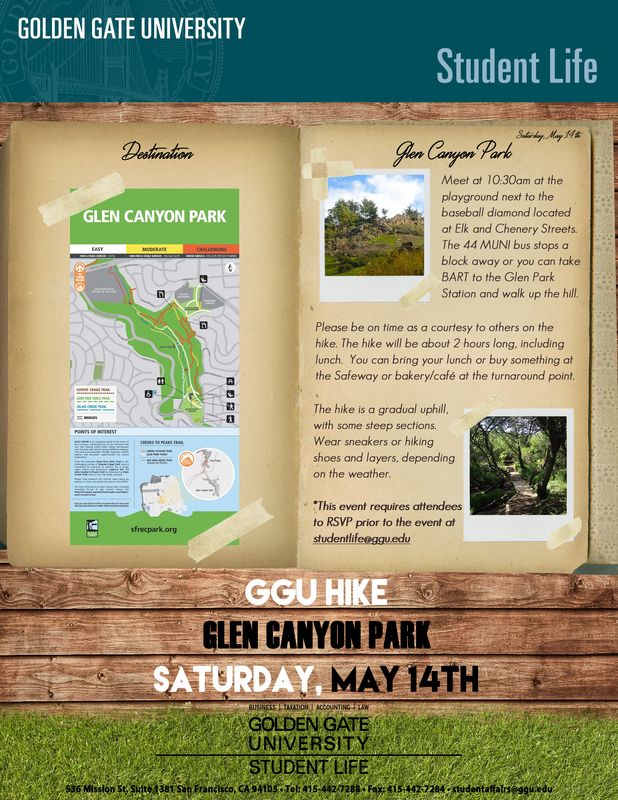 As we mentioned in last week’s #SocialWednesday, Student Life’s Glen Canyon Park Hike is this Saturday, May 14th! It will be a gradual uphill hike, with some steep sections. Student Life suggests you to wear sneakers or hiking shoes and layers, depending on the weather. If you would like to read the full details of the event, click here to view the flyer. The event requires attendees to RSVP prior to the event at studentlife@ggu.edu, so make sure to e-mail them and let them know you’re going! Last but not least, Office of Career Planning’s Drop-in Hours start this Thursday! You can stop by for a brief conversation with a consultant who will be waiting for your engagement in the Business Library anytime between 4:00 PM and 6:00 PM every Thursday until August! Did you check out our website’s newest feature?! You can now browse categories at the bottom of any page. Just scroll down all the way, and pick a category of your choice! We hope you enjoyed reading this week’s #SocialWednesday. If you missed the latest Pinpoint we published last Sunday, make sure to read it here. We are really appreciating the amount of views we have been receiving since the launch, and your feedback means the world to us! Please contribute in this brand new 4 question survey to let us know a little bit about your thoughts. You can also let us know what you think of GGU Social so far, and submit the topics and features you would like us to include by e-mailing us at ggsocial@ggu.edu!